For the last year 2018 marked a momentous occasion in the University of Waterloo’s history. 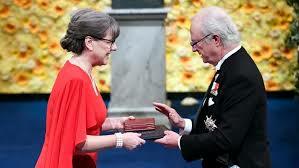 The awarding of the Nobel Prize in Physics to University of Waterloo’s Donna Strickland was for her breakthrough achievements in optics. This marked the third time in history that a woman had been given this distinction. Professor Strickland will be hosting a President’s lecture, and discussing her research on chirped pulse amplification, which is the idea of, “stretching” a short pulse of light before passing it through its gain medium. The lecture will take place in Hagey Hall of the Humanities at 7 p.m. on Wednesday, Jan. 30. This invention led to the possibility of lasers that create very high intensity light while still being able to create precise cuts and without ultimately destroying the laser’s gain medium. These breakthroughs in research have proved to be incredibly impactful, not only for the scientific community, but also for the world as a whole. When the word, “laser” is mentioned, admittedly there are still some who will immediately picture some kind of science fiction weapon or, its simplest form, a laser pointer. But in the past decades, many other forms of lasers have come into play in everyday life, from the lasers in disc players to the ones used to cut through thin materials such as metal and wood. One of the most miraculous examples of the impact that these devices can have on a person’s life has been demonstrated through their use in eye surgery and in our daily lives. This is where Professor Strickland’s research comes into play. The power required for cuts (which measures in the hundreds of gigawatts) was previously only fathomable through very large equipment. Such equipment would not have been able to produce the necessary precision to remold something as delicate as a human eye. The idea of chirped pulse amplification greatly shrunk the technology required to produce high intensity beams of light, leading to much higher precision machinery. Ultimately, this precision is what made it possible for laser eye surgery to finally exist. For more information on how the process works, it would be better to listen to the expert herself explain it. Tickets to this lecture are free and available at https://ticketfi.com/event/2806/presidents-lecture-donna-strickland-nobel-laureate-and-uwaterloo-professor.